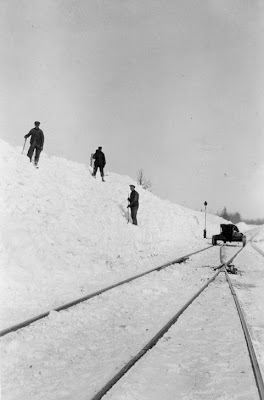 After a big snow storm a Great Northern Railroad locomotive snow plow would go down the railroad tracks first. Then the track workmen would finish up the job around the signal posts and the spots in the tracks where the tracks switched from one track to the other. A signal post and that switching point can be seen in this picture. Notice the little hand car that the workers use to travel back and forth on the tracks.